When you think of German food, it’s often giant sausages and beer tankards. German chain Brotzeit’s new menu available from 8 March 2018 focuses on Gemütlich, the feeling of togetherness and good cheer. It has 24 dishes and features an intriguing Brotzeit Fit menu category — hold your breath for German food with a healthy twist! Ever heard of a German salad? My initial reactions of doubt vanished the second the plate reached the table. 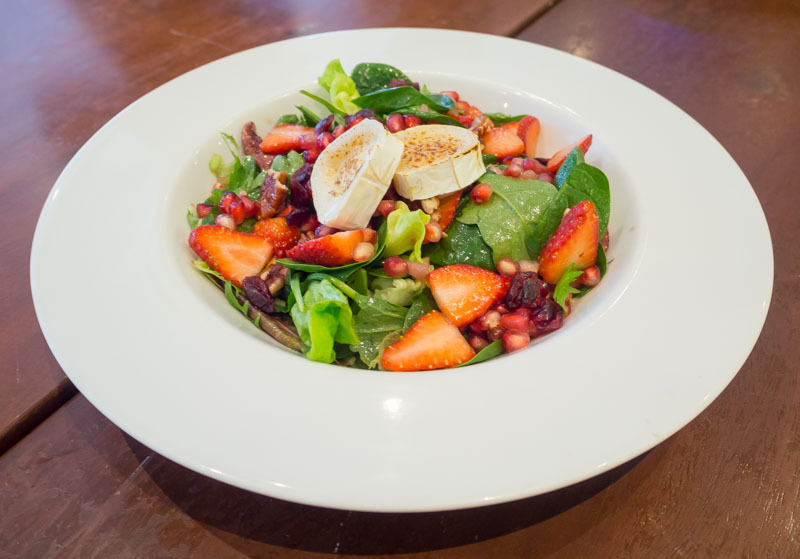 Brotzeit’s Gegrillter Ziegenkase Salat mit Beeren ($21) is a grilled goat cheese salad topped with vibrant berries. True to European food portions, even the salad was massive. Although this was a sharing plate, I shamelessly choped the grilled goat cheese pieces. Creamy and well-seasoned, the sumptuous richness of the cheese really enhanced this bed of mesclun greens. I especially liked the pomegranate seeds that added sweetness to the plate. 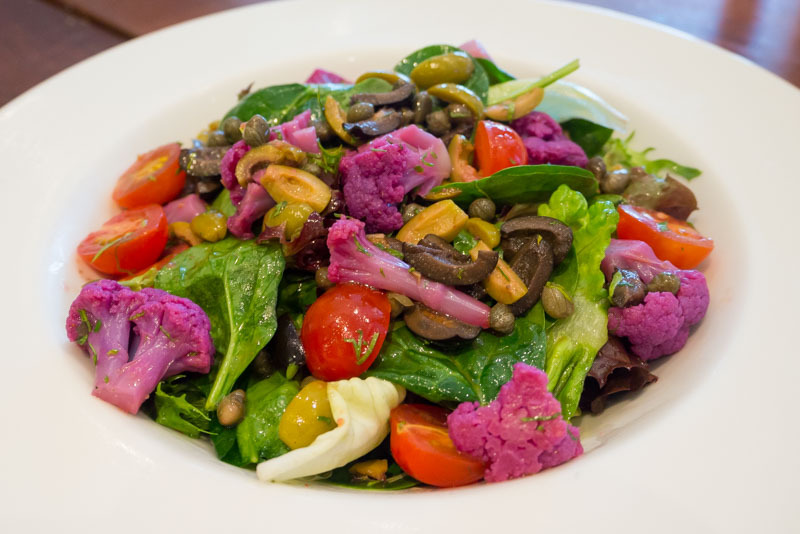 If you like something even lighter, go for Brotzeit’s Violeter Blumenkohlsalat ($19), which features the exotic purple cauliflower. In case you were wondering, the purple cauliflower actually comes naturally with its luxurious purple hue. Who knew greens could be such a treat for the eyes? As a meat lover, I wasn’t as enthusiastic to try this salad. Nonetheless, I was pleasantly surprised by the refreshing sour components that really opened up my appetite. Thanks, Brotzeit for making me eat my vegetables; my mum is very appreciative! For those who aren’t fans of salads, don’t worry. 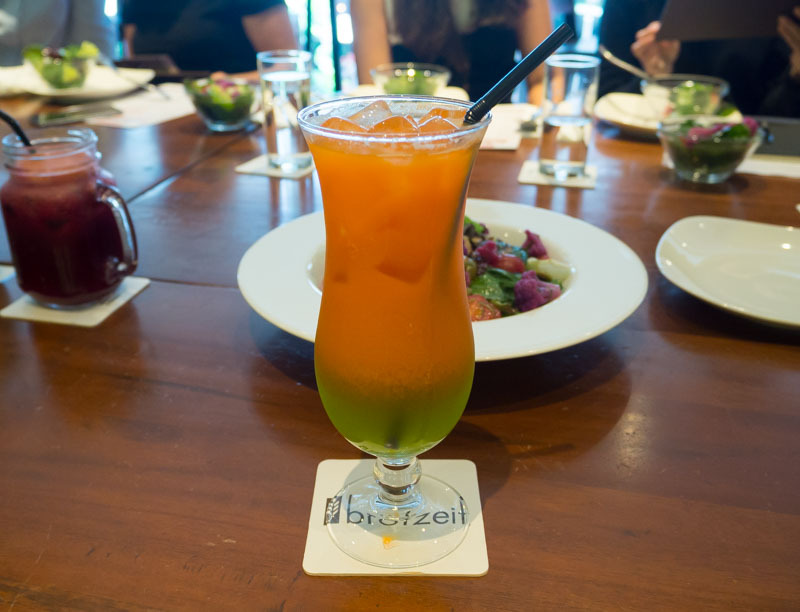 Keep up with Brotzeit’s FIT programme by indulging in their selection of healthy juices. Just look at this beautiful glass of Belly Settler ($8) that one might even mistake for a cocktail! Made of carrot, green apple, spinach leaves and ginger, this drink is rich in fibre and antioxidants, but still deliciously refreshing. 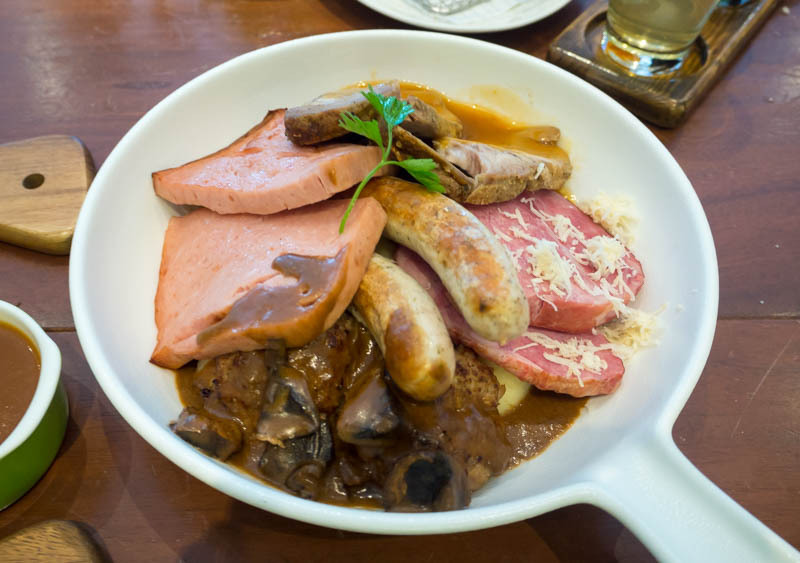 Apart from Brotzeit’s FIT menu category, the new menu is bringing more hearty German dishes to keep diners on their toes. I absolutely loved this appetiser: the fried Potato Sauerkraut Crockets ($6 for 3 pieces) was made for the Asian palate. Exploding with savoury German-imported sauerkraut and mashed potato, the sauerkraut was intentionally cooked to be less sour. I really enjoyed the thin and crispy breadcrumb layer that crackled with every bite. 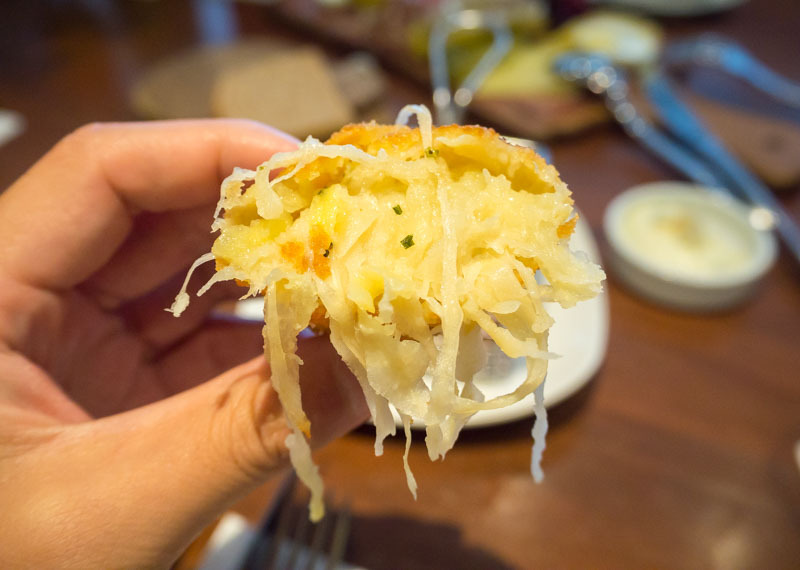 Despite the diverse selection, Brotzeit’s new menu still stays true to traditional recipes. My favourite is the Pfandl ($39), a whopping 1kg worth of meat! There really is nothing that makes my mouth water as much as an entire German feast. With everything from Nurnberger sausages to smoked Kassler (cured pork), this plate is really every meat lover’s dream. 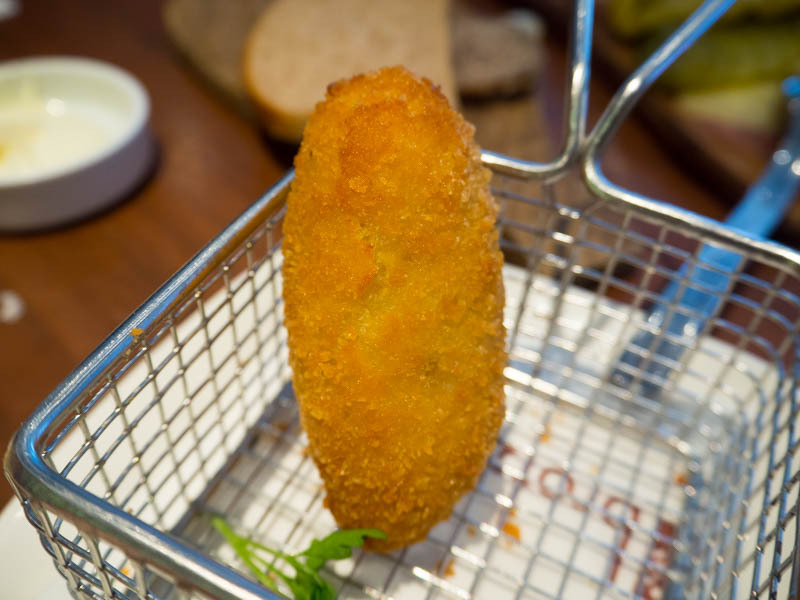 The portion is fit for two to four people to share, so round up your friends. Another German classic you can find is the Klassisch Gekochtes Rindfleisch ($29). 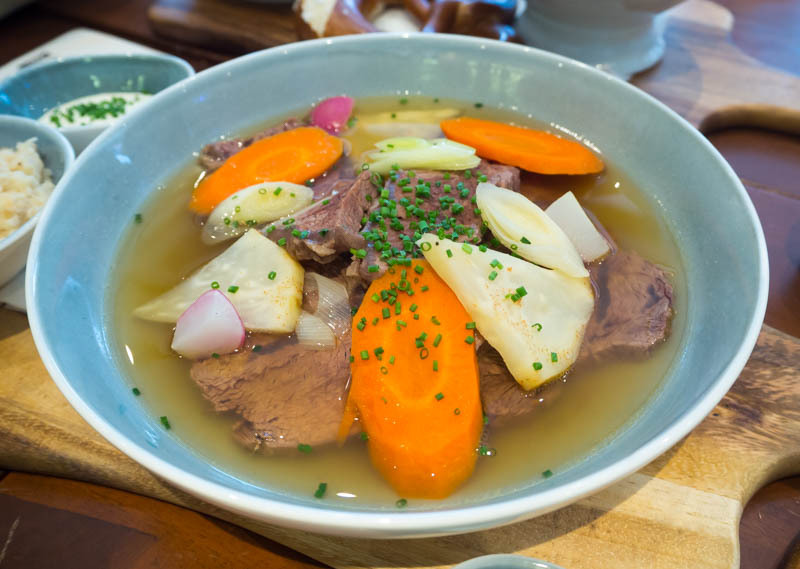 Filled with Australian grass-fed beef ribs and oyster blade, this boiled beef stew is cooked for hours to achieve its tenderness. While the meat was quite lean, there were enough fats to create the sublime melt-in-the-mouth effect that had me smacking my lips for more. The whole table was raving about this dish! Even though I was preparing myself for the onslaught of ginormous German portions at Brotzeit, I actually left without feeling too bloated. The portions for most of the platters may be a little huge, but they are actually quite suited for sharing. Though I am not a salad lover, I found myself really enjoying the fruit-centered goat cheese salad that was the perfect appetiser. Brotzeit is now taking a refreshing turn to offer a more balanced meal. Who knew good German food could be this healthy?